Last year funds were raised to assist with the various schools transition year projects which included trips to Ghana. The previous year there was incredible support for the event as the focus was to raise funds and offer assistance to those injured and effected by the tragic events in Berkeley, California. This year’s focus is on a missionary project in Sudan, which is operated by a member of the Spiritan community. 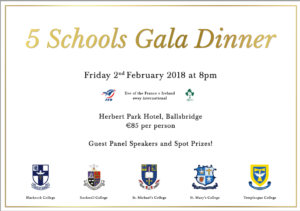 The 5 Schools Gala Dinner will be held in the Herbert Park Hotel, Ballsbridge on Friday 2nd of February.